My 4 day holiday weekend kick-started with a magical evening of slick, creative, quality performances in glowing cricketish whites over a glass of wine in the circle of the Oxford New Theatre. 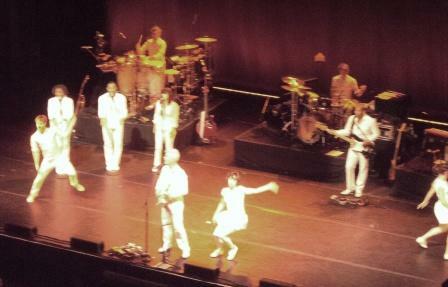 Choreography variously included synchronised office-chair twirling and dancers leap-frogging David while he played. A packed audience of silver-haired and teenage people bounced in the good natured holdiay-ready atmosphere. David’s vocal control and pitch has matured beautifully adding more depth to classic tracks, those played included: Air, I Zimbra, Once in a lifetime, Take me to the river. David was his usual unassuming, audience focused, personable-self. When he noticed venue staff asked audience members to sit-down he stopped the band mid song and gave people explicit permission to stand-up and dance, then picked-up the song again where they had left-off. 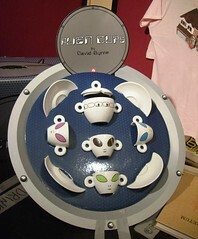 A David-designed alien themed t-set was a featured part of the mechandising. This scribble was published on Saturday, April 11th, 2009. You can follow any banter on this scribble with the RSS 2.0 feed. You can share your inspired musings after typing the anti spam word near the bottom of the page. But no Pinging because its too naughty. sounds good, and the tea set’s a hoot!